Michael Light, Founder and Owner of Miami Luxury Homes, is a top-producing luxury real estate broker who is licensed with the National Association of Realtors (“NAR”) and the Miami Association of Realtors. Michael is a Certified Luxury Home Marketing Specialist (“CLHMS”) who has earned this designation by performing in the TOP 1% of the Miami real estate market. While earning the CLHMS designation, Michael was awarded membership into the Million Dollar Guild, which rewards certified success in the million-dollar and above market. Additionally, Michael is the Senior Director of Luxury Sales and a member of the exclusive Sports & Entertainment Division at Douglas Elliman. Douglas Elliman Sports & Entertainment is a curated, sales division that provides an elite level of real estate brokerage services for clients within the sports and entertainment industries, as well as ultra-high-net-worth parties. Further, this highly-specialized and personalized division is comprised of real estate agents who have an extensive history of working with professional athletes and celebrities, as well as the reputation for tending to every need involved with their transactions. 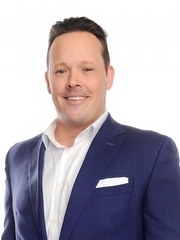 Michael’s unwavering work ethic, extensive background in the real estate finance and development industries and proven track record of delivering excellent service to his clients are just a few of the reasons Michael is sought-after by powerful professionals and influential individuals from all over the world. Born and raised in Chicago, Illinois, Michael’s Midwestern mentality is an asset to his clients who benefit from his 24/7 availability, commitment and honesty. Through outstanding client rapport and his Midwestern hospitality, Michael strives to bring a breath of fresh air to South Florida real estate. He is determined to raise the standard of how real estate is performed in Miami by bringing back exceptional service, pride and work ethic. In addition to his drive for impeccable service, Michael provides his clients with a unique perspective. Prior to launching Miami Luxury Homes, Michael enjoyed a multifaceted and lucrative career in real estate finance and development. He began as a Union Foreman for commercial construction projects in Chicago and went on to own and operate a mortgage and finance brokerage. His knowledge of crucial details from building materials to financing to sales gives his clients the unique advantage of multiple points of view and expertise. Serving clients in Coconut Grove, Coral Gables, Pinecrest, Downtown Miami, Brickell, Miami Beach, Surfside, Bal Harbour, Sunny Isles Beach and Golden Beach. Michael currently resides in Coconut Grove with his wife and their 2 rescue pups, Bettis and Peyton, and enjoys volunteering and sponsoring a variety of local and international organizations. Get to know more about Michael by following the Miami Luxury Homes Blog. He may also be contacted via email at michael@miamiluxuryhomes.com, on his cell phone at (786) 566-1700 or office phone at (305) 350-9842.